Starting out, fleece layered and ready. 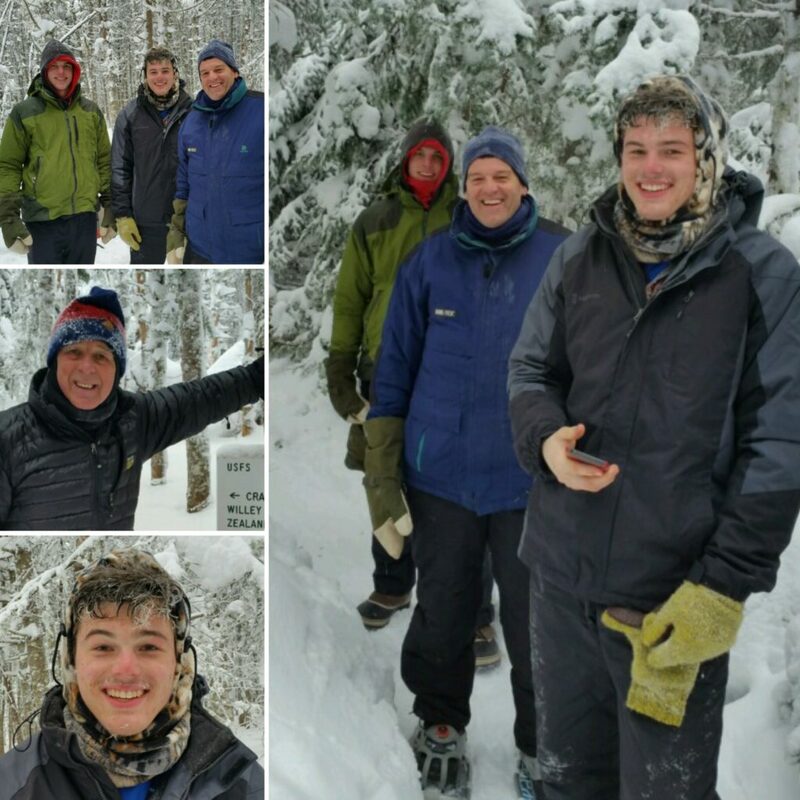 What began as a planned hike to Mt Willard with side trips to some of the short loops and spur paths in the area for four hikers turned into an awesome adventure for three family members. 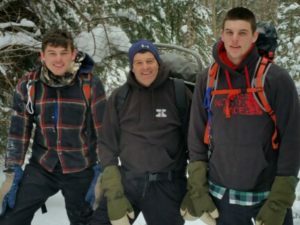 A father and two sons to Mt Tom (4051′). Due to severe temperature conditions one member of the original party opted out (it’s not for everyone). The temperature at the Highland Center this morning when I pulled in was minus 10. According to the National Weather Service the projected temperature at the summit of Mt Tom with wind chill was a chilly minus 24. Brrr! Starting out on the Avalon Trail, but not toward Willard as was originally intended. These guys were strong, tough, and ready. One of the trio was visiting from Alaska. We informed him it was cold. We parked at the AMC Highland Center because the access road to the train depot parking lot had not been plowed. After gearing up at the AMC property we set out across the wind-blown field leading to the Avalon Trail. Yes it was cold and windy, perfect conditions for a classic winter hike to a four thousand footer. Wearing snowshoes and just the right amount of layered clothing we made our way up the Avalon trail. We hiked at a steady pace along the flat before reaching the hills. Taking our time with measured stops for rest, food, and water we reached the spur junction to Mt Tom in two hours. If also doing Field, staying on Avalon would be the best choice. But the hit the A-Z Trail toward the Mt. Tom Spur. 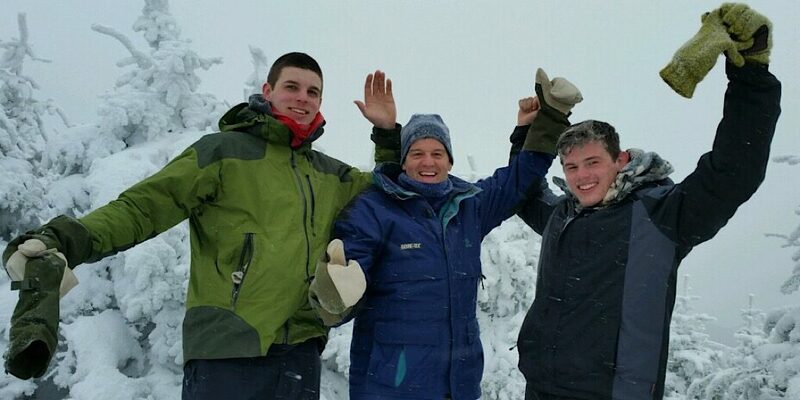 They are loving it as they climb higher and higher… even the fellows with antifreeze in their ears. More photos of the team (and guide) as they ascend further reaching the spur trail, then summit. We quickly made our way to the summit and although there was too much cloud cover for a view, we were entertained by a lone Canadian (gray) jay seeking a handout. The handout did not happen, leaving a very unhappy and vocal Jay to forage for himself. Due to wind chill and temperature we did not hang around long. We made our way back to the AMC center. Afterwards we bid a fond farewell, shook hands, and all agreed it was a wonderful adventure. Summit photo. It looks and sounds like it was indeed a wonderful adventure, Jeffrey. Thank you for your words and photos.